Rachael Rachael, a mom of two daughters, is a freelance editor and writer who enjoys gardening and dreams of keeping chickens in her suburban St. Louis backyard. In her spare time, she helps to edit her husband’s science fiction books. Read more of Rachael's work at www.rachaelsjohnston.com or contact her by emailing rachael@mumblingmommy.com. My oldest daughter just turned 5 years old. Megan is a bright, thoughtful, and creative little person who loves to be independent and continually amazes my husband and me. She also recently scored in the 99th percentile in an academic screening offered through our school district. We like to brag on her smarts, but we also know things could have turned out very differently. Halfway through my pregnancy with Megan, she was diagnosed with fetal ventriculomegaly. The ventricles in her brain were slightly larger than normal. It’s a condition that occurs in about 1 in 1,000 births. By itself, the condition is not necessarily a problem. But it has the potential to develop into hydrocephalus, which puts pressure on brain tissue and can cause brain damage or require surgery at birth to prevent or lessen any further brain damage. A specialist initially suggested I might want to terminate my pregnancy. It was a sad thought at the time, but it’s a sickening thought when I look at my healthy, intelligent 5-year-old and realize that a doctor once casually talked about ending her life. All the worries began shortly after my ultrasound at 21 weeks. The ultrasound indicated Megan was healthy, but the technician couldn’t get her into a position to get a good view of her heart. We joked about the baby not cooperating and scheduled another ultrasound for the following week. I was pleased to get another view of the baby. When the second ultrasound was finished, the technician told me my doctor would “discuss it with me.” She sounded like she was holding something back, and it felt slightly ominous. A few minutes later, my doctor told me Megan’s brain ventricles were mildly enlarged. She referred me to a group of perinatal specialists at the hospital where I would be delivering. I was fairly calm. I liked and trusted my doctor. She said she had delivered a baby years ago with the condition who was now a healthy patient in her practice. She told me not to worry, so I didn’t. At least not too much. Megan at 21 weeks gestation, before the worries began. Around 23 weeks, I had my appointment in the hospital’s perinatal unit. I took the afternoon off work and went alone. The technician performed an ultrasound and then left me lying on my back on the table in a dim exam room while she fetched the doctor. I still had my pants pushed down around my hips with gel on my belly because the doctor would want to take a look himself. I waited for at least 30 minutes. I brought a book to read, but it was dark and I wasn’t in a comfortable position to do much reading. I grew worried and irritated. “I wasn’t wondering,” I said. “Do you want to speak with a genetic counselor?” he asked. A pretty young female genetic counselor with long blond hair sailed in and told me her name, handed me a business card, and disappeared. I thought counselors were supposed to be helpful, but I was not feeling reassured. Somehow, I managed to wipe the goop off my belly, pull my pants up, and heft myself off the exam table. I felt numb as I drove home. Terms the doctor had thrown around like “brain damage” and “abortion” swirled through my head. I thought about amniocentesis, an invasive and sometimes miscarriage-inducing procedure. My husband, Josh, had just gotten home from work and was waiting to hear how things had gone. I told him the specialist was a jerk, and I cried. I returned the following week for the fetal echocardiogram, and I had Josh come with me. I needed an extra set of ears and supportive arms. The echocardiogram was an elaborate term for an ultrasound that looked at the baby’s heart in greater detail. We were assured Megan looked healthy in every other way. There were no signs of Down Syndrome, mental retardation, heart defects, or other issues. She just had mildly enlarged brain ventricles. I saw the same specialist again, and he had the gall to repeat that I was too far along to terminate the pregnancy. My husband swiftly stepped in and affirmed our desire to carry the pregnancy to term. The doctor seemed to catch himself, and he paused to explain that where he had done his residency on the east coast, affluent couples chose to abort because of easily fixable conditions like cleft palates. How depressing, we told him. We left the hospital that day feeling somewhat reassured because Megan’s condition seemed isolated. Still, I was instructed to come back every two weeks for the remainder of my pregnancy for ultrasounds to monitor the baby. Throughout the second half of my pregnancy, Megan’s ventricles measured around 11 millimeters, which is considered to be mild enlargement. My mother-in law, a registered nurse who works in another department in the hospital, offered some of the best advice. “That’s not your baby,” she said. “It’s God’s.” More practically speaking, she’s a mother of four and recounted the major behavior problems she faced with one of her other sons, including run-ins with the law and jail time, and said she would welcome a child with special needs or another disability if she could choose between the two. I couldn’t argue with that logic. I took comfort. We prayed. Life went on and we coped with the ventriculomegaly diagnosis. Two weeks later, I showed up for the first of many follow-up ultrasounds. My mother-in law showed up unexpectedly while I was in the waiting room. She had just gotten off her shift and asked if I wanted her company and support. It was a treat for her because she had never had an ultrasound herself and had never witnessed one. rest of my ultrasounds with this doctor. That was the only time I was ever able to schedule with him. Apparently, he was popular with all the pregnant ladies. I started to relax more after that appointment, though. My last ultrasound was around 36 weeks. Megan’s ventricles were still slightly enlarged. At that point, the bones in her skull were starting to fuse together and thicken, which was what they were supposed to do. 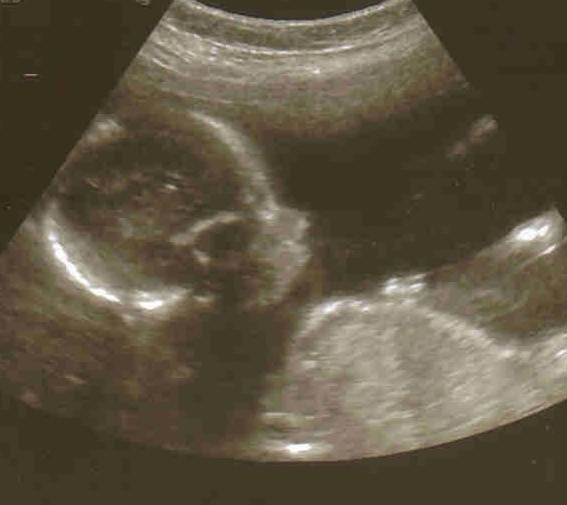 As a result, though, it was getting harder to get a clear ultrasound image. The specialist I saw that day released me for the remainder of my pregnancy, with instructions to seek follow-up care for Megan after her birth. Snuggling just hours after Megan’s birth. became more intense and painful. Now, I know better. 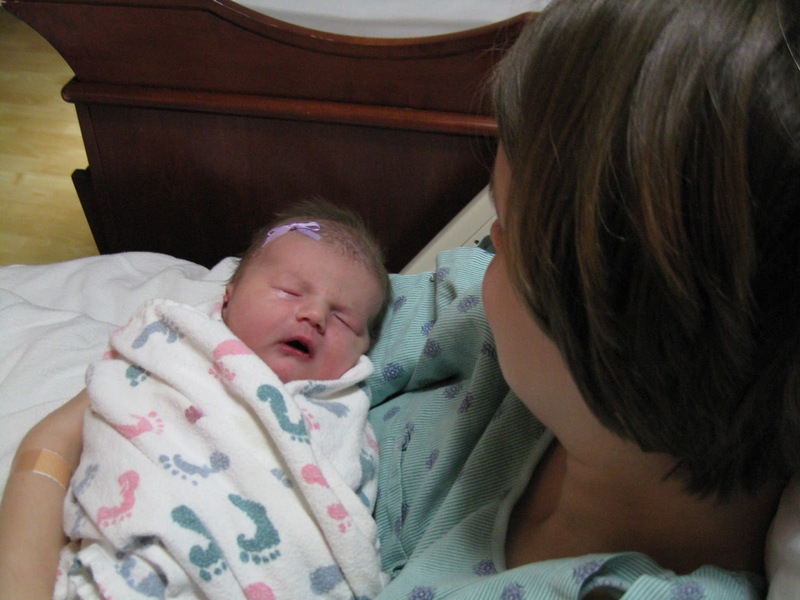 Oddly, there was no sense of urgency about Megan’s condition once she was born. I wasn’t too worried. Her routine checkup with a hospital pediatrician went well, but I self advocated and mentioned the condition to the baby nurse. Doctors performed an ultrasound on Megan’s head on the morning we were discharged. The baby nurse brought Megan back to my room explaining how she had washed her hair to get all the ultrasound goop off, and then we waited forever to hear the results of the ultrasound. I ordered lunch. We sat around. I nursed Megan. The nurse pestered and made phone calls and shook her head over how the doctors were taking their time. Finally, we received word that her head was perfectly fine. Her brain ventricles measured completely normal. Megan was in excellent health, and it was the culmination of months of worry, waiting, and prayer. I dressed Megan in a tiny purple sleeper, buckled her into her car seat, and we were escorted down to the hospital’s main entrance where Josh was waiting with the car. I was exhausted but elated as we drove home that afternoon to begin life as a family of three. Our daughter was perfect, and God was good. I still continue to look at my oldest daughter in wonder, especially with that first specialist’s words still swirling in the back of my mind. “It’s too late to terminate,” he said. A few days old and slightly jaundiced but otherwise perfect! Great story, Rachael. I remember when your daughter was born, back in the Xanga days. So grateful she is healthy. Thank you, Dayle. Back in the Xanga days … When you put it that way, it does seem like a long time ago. I've been glad to have your friendship during these years. Katherine, thank you for sharing. I'm glad this story offered some encouragement. Praying for your little one. Your story brings me so much hope! I'm 22 weeks pregnant and our daughter was just diagnosed this morning! We too got the "it's too late to terminate", but our dr was nice about it and assumed we didn't want to anyways. We're hoping to get the same outcome as you guys, your daughter Megan is so beautiful! Rachael, thanks for sharing your story. My daughter's measurements were around 11 mm, I think, but it's been a long time. 12 mm is pretty mild. Good luck! So happy to have stumbled upon this! My husband and I are expecting our first child, a little girl, in just a week or so. She too has been diagnosed with a slightly enlarged ventricle on one side. Luckily the other has shrunk completely to normal, so just one to concern ourselves with. But we continue to pray for her health and development as we approach the big day! I am 36 weeks pregnant and I am also dealing with the same problem.. Hope I would experience the same result alike you. My neontologist and my OB told me wait and watch…they said there will not be any problem. Praying God and Hoping for the best output. Thank you for publishing this story. I am 33 weeks pregnant with my first baby and he has been diagnosed with mild isolated ventriculomegaly. It has been quite a terrifying time but now that the diagnosis is ‘mild’ and hearing stories such as yours provide great comfort! So glad my story can offer you some hope, Kitty! Good luck and best wishes for a good outcome! I can fully appreciate what you went through with this, same situation for me and my son who has irregular sized ventricles which is very unusual. Luckily I didn’t follow the specialist advice to terminate, I was told by the hospital it’s like winning the lottery someone has to have a disabled child, you can understand my upset at that. I was dreading the birth with no idea what to expect, my son is now 4 years old and you would never know he had the condition, he’s no different from any other child. I know it’s scary but I would advise anyone in this position to follow your heart the specialists don’t always know best. Thank you for sharing this hopeful story. My uss which was due to my bump measuring small yesterday highlighted that one side is measuring 11mm at 28 weeks. No further explanation as to why but I have a consultant appointment for a more detailed scan in 2 days. I’m devastated as everything with baby has been fine up until now. I’m just hoping my story mirrors yours. I’m 27 weeks pregnant and our second son was diagnosed with same, measuring 15.2mm. I’m so scared. I’ll be going back for another sonar next week. Praying for a good ending like yours. Thanks for sharing your story. Well, my baby was indeed born with hydrocephalus. He’s going to be monitored by the neurologist and neurosurgeon. He also had many other birth defects. Yes it’s quite stressful. Wow thanks for writing this. I had a similar experience with my now 8 month old boy only with bigger dilation numbers. His ventricle measurements were 15mm and 16mm at 19 weeks. The second half of my pregnancy was a nightmare. I was given the choice to terminate. It makes me shudder to even think about that word and how I was forced to consider it as my healthy beautiful son is laying beside me. I was not given a very good prognosis by the doctors and was not given much encouragement that everything would be fine. I was told I would likely have a c section (I didnt). I went through an amnio which came out clear. It was such a scary and confusing time. His ventricles seemed stable from ultrasounds as thevoregnancy progressed. They did go down to normal by birth but we also didn’t know this until his head ultrasound three days after birth. At that point we could finally breathe. I still have a hard time thinking about it and I’m still trying to get over the trauma of it all. I just want to enjoy my son without remembering that nightmare during the pregnancy and his birth. I also wonder how many perfectly healthy babies are aborted due to fear and a lack of information given to the parents. So after the birth of your baby did you get an MRI scan done? How is the baby developing? 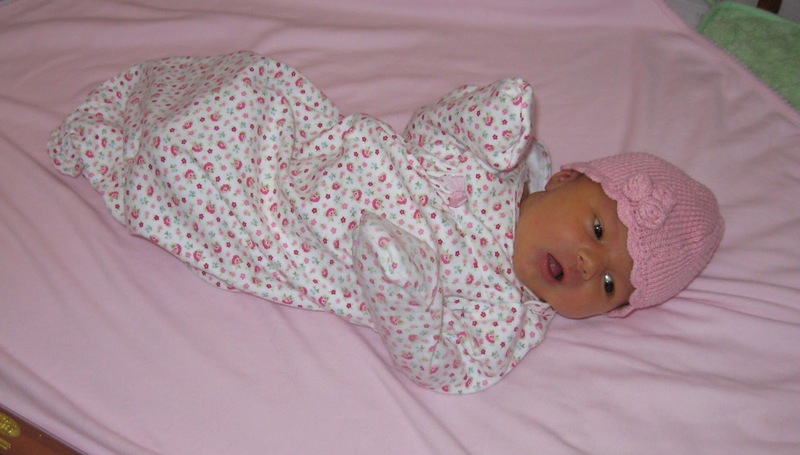 After birth, she had an ultrasound done that indicated her ventricles were normal size. She is now 9 years old and doing great! Racheal thank you for writing this my heart so desperately needed to hear this today. Yesterday we went for our 19 week ultrasound and same diagnosis the brain ventricles were slightly enlarged. They too told me that termination is an option. Thank you for your testimony of faith for your little girl. I too am having a baby girl to add to her big sister who will be a month shy of 2.5 when baby 2 is born in February. Since finding out the prognosis of our little one I have lifted this girl up in prayer with all my godly women can start praying for our little girl.